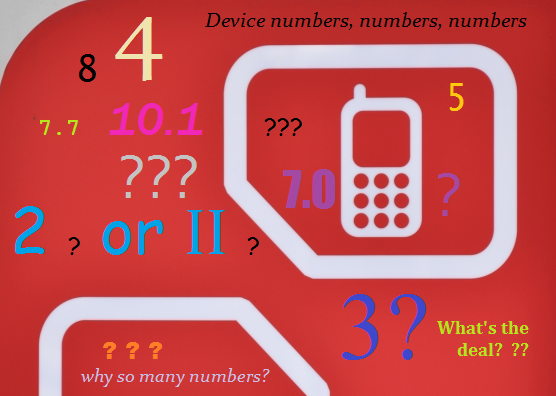 Mobile devices: Understanding those numbered names – Technology… in PLAIN ENGLISH! Naming and numbering are completely up to the companies, so there’s no standardized reference – This means the opening paragraph of this article is not always true! For example, when you look at the Samsung Galaxy Note and the Galaxy Note 2, the 2 at the end of Note 2 is to tell people that the Note II (officially it’s Roman numeral II, not the everyday 2) is, in fact, the new and improved version of the original Galaxy Note! So in a nutshell, it’s a hodgepodge, it’s not intentional or sinister, and the best way to keep up with what’s improved and/or what’s been given a new snazzy number is to read tech articles on CNET, ZDNet, etc and become familiar with mobile device culture and a sprinkle of history. Another good site is phonearena.com which will tell you officially whether a model’s a phone or a tablet by looking at the model’s specs page. Wikipedia is superb too.